The Anglican comedy: A Communion in tatters and a fleeing Archbishop.What’s next? In a blistering attack not seen in modern memory, the Metropolitan and Primate of the Anglican Province of Nigeria ripped the Archbishop of Canterbury saying his sudden resignation announcement will leave behind a Communion in tatters: highly polarized, bitterly factionalized, with issues of revisionist interpretation of the Holy Scriptures and human sexuality as stumbling blocks to oneness. Archbishop Nicholas D. Okoh noted that when Dr. Rowan Williams took over the leadership of the Anglican Communion in 2002, it was a happy family. He is leaving it with decisions and actions that are stumbling blocks to oneness, evangelism and mission all around the Anglican world. Okoh went so far as to say that it was like being “crucified under Pontius Pilate”. 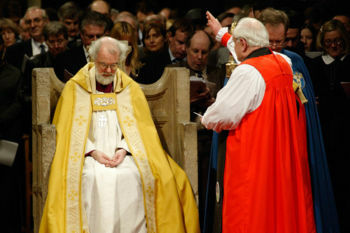 The leader of the world’s most populace Anglican Province (20 million) said the lowest ebb of this degeneration came in 2008, when there were two “Lambeth” Conferences — one in the UK, and an alternative one, GAFCON in Jerusalem — that saw more than one third of the Anglican Communion’s bishops as “no-shows” at Canterbury. The trend continued recently when many Global South Primates decided not to attend the last Primates’ meeting in Dublin, Ireland. The Nigerian archbishop said that because Williams did not resign in 2008 over the split Lambeth Conference, he should have worked assiduously to “mend the net” or repair the breach, before bowing out of office. Okoh also blasted the covenant proposal saying it was “doomed to fail from the start”, as “two cannot walk together unless they have agreed”. My prayers are for the Anglican church. May the way back to Rome not be an option and hey don’t even think about swinging to the left. But who am I to suggest the path you will take? I may be too late. I will ceaselessly pray that God in His grace will steer you to Himself. Even then, it could be too late.